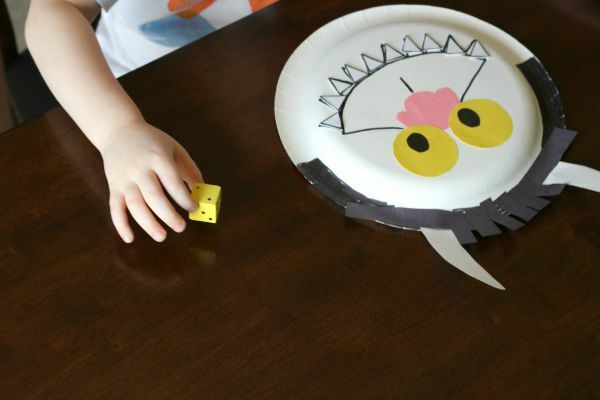 This Where the Wild Things Are counting game is a fun, hands-on activity to go along with the book. 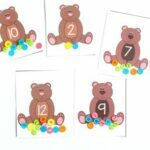 While playing, children practice counting, learn one to one correspondence and even get some fine motor practice. This month, the Virtual Book Club for Kids is featuring Where the Wild Things Are by Maurice Sendak. 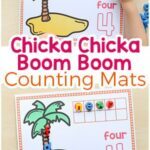 We are sharing lots of fun activities to go with the book, so make sure you check out all of the other posts below! We love the book Where the Wild Things Are! My son is so mesmerized by it every time I read it. He especially loves the wild things. 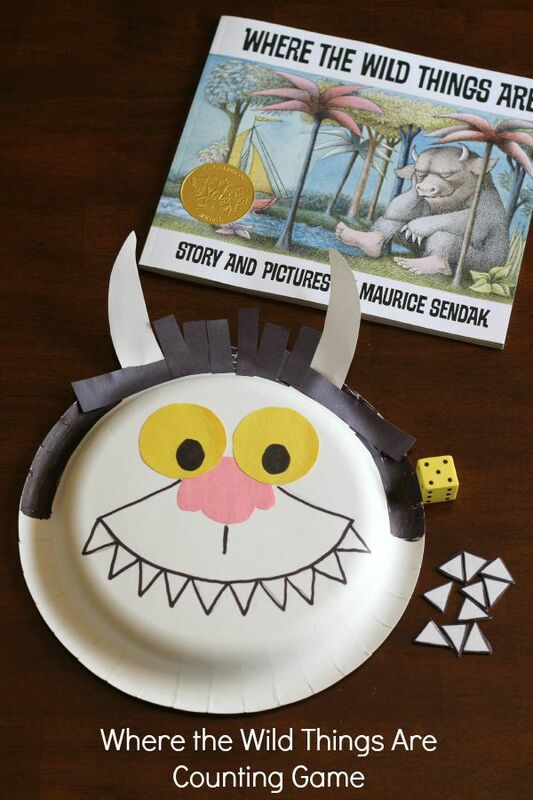 So I thought it would be fun to create a wild things activity to go along with the book. 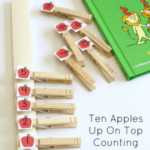 This counting activity was super exciting for my preschooler. He got a real kick out of adding “sharp” teeth to the monster’s mouth. He wanted to play it again and again and has even asked for it since the first day we played it. 1. 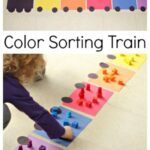 Cut out yellow circles for eyes and add a black dot to the middle with the black permanent marker. 2. Cut out a pink nose and two white horns. 3. Cut out hair for the wild thing from the black construction paper. 4. 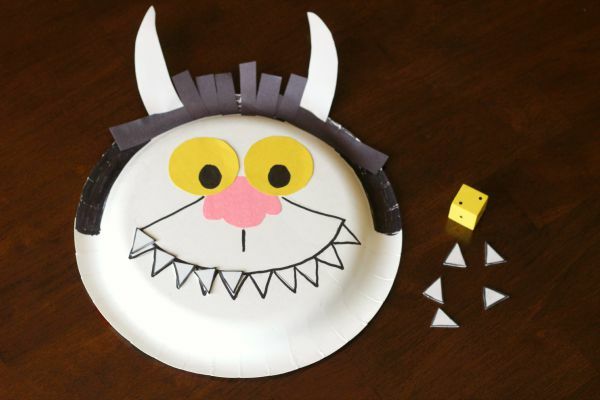 Glue the eyes, nose, horns and hair to the paper plate. 5. Draw a mouth and teeth on the plate. Make sure you space the teeth out well so there is plenty of room to add the craft foam teeth on top. Another option is to just draw the mouth and leave the teeth off. Then the child will just add the teeth to the mouth and not worry about matching them up. 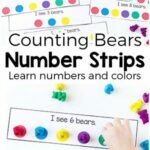 I instructed Evan to roll the die, identify which number was represented by the dots facing up and then add that many teeth to the wild thing’s mouth. Once all of the teeth are added you can remove the teeth and play again! 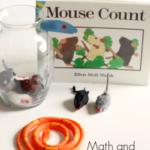 While playing, Evan practiced counting, subitizing, and simple addition. He actually got a lot of fine motor practice as well because he was a major perfectionist about having the teeth perfectly lined up with the ones I drew on the plate. It was quite a challenge for him, but not so much that it was frustrating. 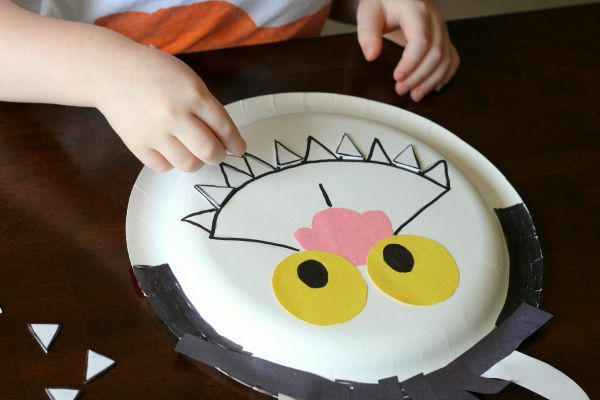 Evan was thrilled with the wild thing paper plate face I made. He really thought it looked just like his favorite wild thing. I think I may cut holes in the eyes and add a popsicle stick at the bottom to he can use it as a mask for pretend play as well. 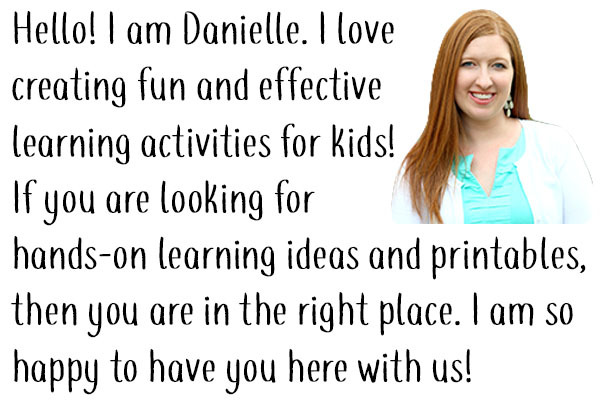 For even more fun and engaging Where the Wild Things Are activities, check out the posts below!